Ethernet Network Adapter (for license identification) or the USB license dongle (purchased separately). The license of this program is permanently bound to a special custom license dongle (USB) or to the MAC address of one physical Ethernet LAN card. The license key will be computed based on four customer specified text lines (header to all reports) and the MAC address. After you complete the purchase process the vendor will contact you via e-mail to obtain required data soon. The installation has been thoroughly tested with Windows Vista and Windows 7 and 8. AnTherm is a 32-bit and 64-bit Windows application. The major difference between 32-bit and 64-bit versions of AnTherm is the amount of memory that the application can access. 64-bit AnTherm can allocate considerably more memory than 32-bit AnTherm. AnTherm 32-bit can access up to 3 GB of memory. This limit raised by the infrastructure applies even when AnTherm is executed on a 64-bit system (e.g. Vista/Win7/Win8 64bit). 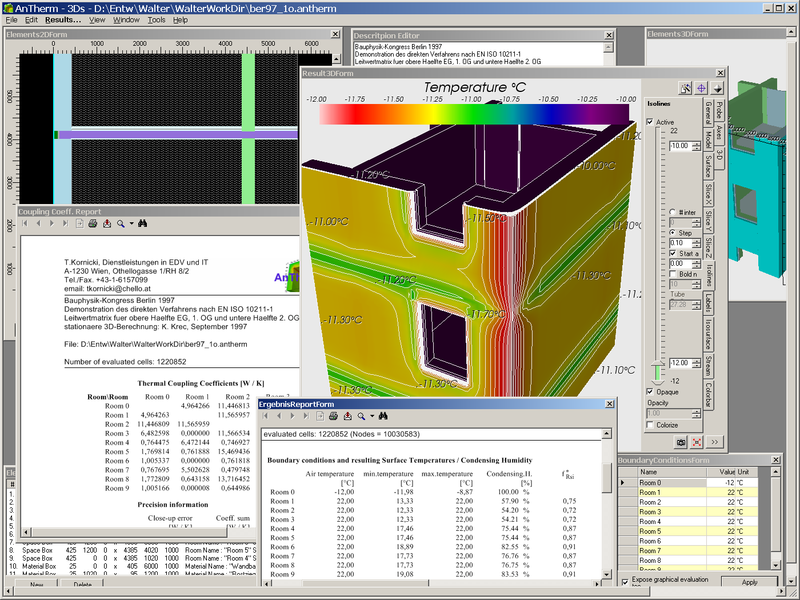 This technical limit allows solving of systems up to 20.000.000 equations and to receive resulting thermal heat conductance and numerical results of temperatures (160.000.000 nodes). The limitation for the memory intensive graphical evaluations is (currently) for models holding ca. 2.500.000 equation cells (10.000.000 nodes). AnTherm 64-bit enables the calculation of bigger applications since it can address up to 8 TB of memory (in theory). However, the de facto limit is usually several GBs and depends heavily on the employed hardware, operating system and runtime conditions (parallel running processes). To comfortably work with AnTherm the display area available to the program shall be large enough. With AnTherm you receive a highly interactive visualisation application. Modern visualisation technologies used by the program, with their roots in the world of supercomputers, raise certain demands and requirements towards capabilities of display devices used. During long term experiences in use of the program it has proven, that the minimum requirement of 1280x1024 pixels display is the absolute minimum for comfortable interaction with the program - even if the whole display area is devoted only to AnTherm reaching some windows is only possible by scrolling. It is all but impossible to avoid overlapping of windows - even if the size of windows has been reduced up to the smallest limit, leading to very crowded working and output areas. Optimal interaction conditions start at the resolution of 1280x1024. At resolution of 1600x1200 there is enough space on screen for AnTherm and for windows from other applications allowing the user to keep good control of the desktop. If you click on the picture above it will be shown in its original size on your screen (under certain conditions you will have to enable original size display in your browser). Therefore we ask you to consider this minimum requirements when choosing equipment for your workstation.